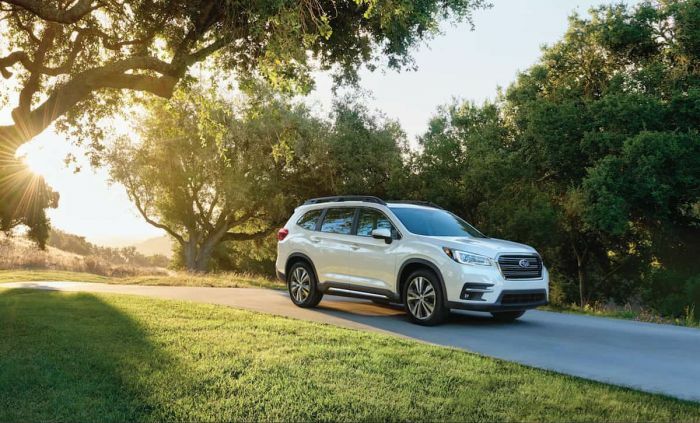 As Subaru is about to roll out their all-new 2019 Ascent family hauler, they want to help customers keep their pets safe in the new 3-Row SUV. Subaru of America, and the Center for Pet Safety (CPS), a non-profit research and consumer advocacy organization, unveiled their recommendations for safe pet travel in SUVs this week. The Japanese automaker who’s goal is passenger safety, is also working on keeping your furry family dog safe too. Subaru and the pet-advocacy organization say a pet who is not properly secured can become a projectile, resulting in serious injury or worse for both them and the human passengers in the event of a crash. Subaru who sells all-wheel-drive SUVs and CUVs like the Outback, Forester, and Crosstrek, knows over 60 percent of their customers own a dog. Pets 20 lb. or less can be harnessed or secured in carriers in the 2nd row Captain’s Chair. Larger pets, more than 20 lb., should be properly secured and travel in the 3rd-row bench directly behind one of the Captain’s Chairs. NEVER place your pet on the floor between the Captain’s Chairs in 3-row SUV models, as this could result in the pet becoming a projectile and cause serious injury to both the pet and vehicle passengers. When traveling with both children and pets in a 3-row vehicle with Captain’s Chairs, secure the child in the 2nd row and secure the pet in the 3rd row, on the opposite side of the vehicle as the child.